Madam Woo wasn’t at Queenstown when I last visited the town in 2014, so that got me to try something new! And no regrets. The interior is so unique that it has light touches of Malaysian history yet not overboard and still carries the fusion within. 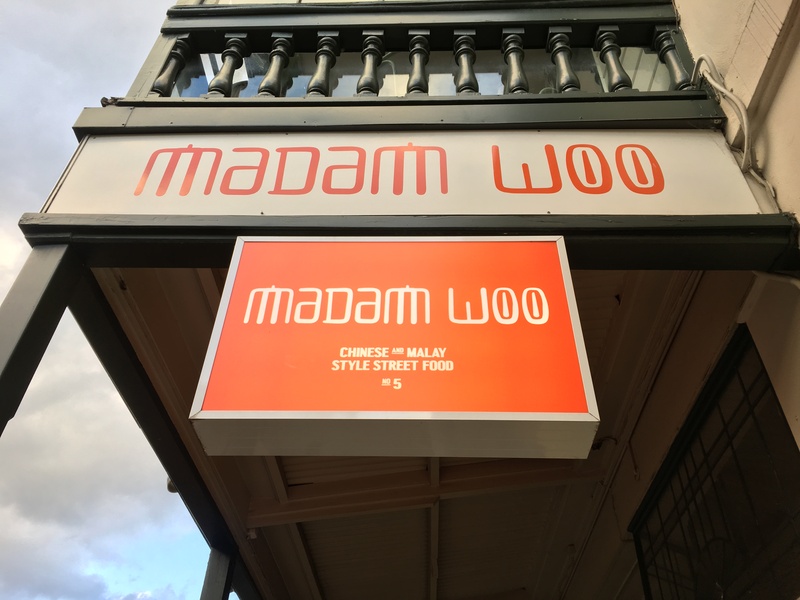 Madam Woo is spread around New Zealand in cities like Christchurch, Takapuna, Hamilton and Queenstown. It was very busy when we walked in. We had no booking but was was seated within 5 minutes after cleaning up a table for us. We ordered two refreshing non-alcoholic cocktails both had a asian flavours in it. Their drinks lists is quite big.. I picked Ching Cha, Lychee, kaffir lime & cold brewed green tea – I thought it was a refreshing drink after a 4 hour hike. Shaolin Temple is with Ginger ale, grenadine & maraschino cherry. J thought it tasted like medicine. I thought it was fine, it was the maraschino cherry that probably made it a little “medicine-like”. I prefer my pick, but Shaolin Temple was also good. The skewers itself wasn’t flavoured well enough. Tumeric flavours were light and the dipping sauce lacked savoury. It was more a chutney of some sort. For a thin piece of skewer for $3.50 each, I found was dear. Hainan Chicken and Rice, $26 came with soup. The chicken was tender but the rice wasn’t the best that we’ve had in Melbourne in a suburb called Bayswater. It was still good to dip with the red chilli sauce. Soup was seasoned well. No complaints. Saving the best dish to last, the highlight was the Stir Fried Pork Belly, $19. It was reasonably priced compared with the other two we ordered. The sauce was THE BEST… I know the menu just says oyster sauce, but I can taste that there other additions to make the sauce sweet. I wish I could get the recipe. Greens were bedded with the soy-like sauce soaking up the flavours. It was a good compliment with the hainan rice that lacked a bit of flavour. The spiced crackling crumb was sprinkled on top but I was searching for the pork crackling skin. If only it was part of the dish, it would make a 5/5 dish! Overall, friendly staff, fun atmosphere, and could stay at Madam Woo for a long time if I was a drinker! Give it a try!